Effects of copyrights on science: Summary Copyrights grant publishers exclusive rights to content for almost a century. In science, this can involve substantial social costs by limiting who can access existing research. This column uses a unique WWII-era programme in the US, which allowed US publishers to reprint exact copies of German-owned science books, to explore how copyrights affect follow-on science. This artificial removal of copyright barriers led to a 25% decline in prices, and a 67% increase in citations. These results suggest that restrictive copyright policies slow down the progress of science considerably. There are two productivity puzzles: Much has been written about the productivity puzzle. But there are actually two puzzles apparent in the data – one in the level that hit at the crisis and the other in the growth rate, which is a more recent phenomenon – and they could be driven by completely different sources. Distinguishing between the two puzzles is important precisely because of these potential differences – if anyone analyses the puzzle as a whole looking for the force driving it, the actual underlying variety will confound our estimates of the relative importance of these drivers. and why this distinction can be important, using the example of a simple growth accounting decomposition of productivity growth into capital deepening and technological advancement. Productivity measures productivity ... that's it: Justin Fox at Bloomberg put up a few articles (here, here) recently digging into trends in productivity in the US manufacturing sector. The overarching theme of the two articles is that claims regarding the success of the manufacturing sector in the US (he cites Binyamin Applebaum’s article specifically) are overstated. Fox’s first article is titled “No, U.S. Manufacturing isn’t Really Booming”. I’m not going to tell you that manufacturing is booming. I’m also not going to tell you that Fox is right about it not booming. I am going to tell you that making claims about the business or financial success of manufacturing based on things like multi-factor productivity (MFP) or labor productivity, as Fox does, is using these measures incorrectly. The “health” or “success” or “boominess” of manufacturing are not things one can infer from productivity statistics. There's much, much more in the original post. Third, analysis by Barry Eichengreen et al suggests that dysfunctional government eventually grinds down productivity growth. This strikes me as intuitive: an $18 trillion economy requires a government that can efficiently diagnose problems and prescribe solutions in areas of climate, infrastructure, education, innovation, social insurance, poverty and more. Our government, on the other hand, tends to engage in aimless votes to defund Obamacare and shudder the EPA and IRS. Technology versus the Distribution of Workers in Aggregate Productivity: There was a recent post by an engineer rebutting Robert Gordon’s (and others) thesis that technological change was slowing down. The evidence cited is a series of plots and figures showing how specific technologies (battery storage, energy efficiency, computer speed, etc..) are advancing just as fast as they have for decades, if not faster. And there were a number of responses along the lines of “See, Gordon is wrong!”. The mistake here is that this doesn’t constitute evidence that Gordon is wrong. But the mistake is partly forgivable because Gordon himself indulges in these kinds of anecdotal arguments to advance his thesis, and so it seems as if you could refute his conclusions by offereing alternative anecdotes. But the important part of Gordon’s argument is not that specific technologies are or are not advancing. It is that aggregate productivity growth is slowing down. And aggregate productivity growth depends not only on individual technologies, but crucially on the distribution of workers using those technologies. Arguing about only those individual technologies is like using an increase in the price of milk to argue that inflation must be high. Aggregate productivity growth depends on what we can call “within-sector” growth, which is going to be tied closely to those individual technologies. But it also depends on “across-sector” growth, which is tied to the movement of workers from one sector (or job) to another. If workers are shifting from high- to low-productivity sectors or jobs, then aggregate productivity growth may fall even though nothing happened to actual technological change. I’ll make this more clear below, but here’s a quick summary of what I’ll try to establish. Gordon’s critics could well be right about their individual technologies, and yet wrong about this having anything to do with aggregate growth, because those sectors may not employ many people. And Gordon can be right about aggregate growth, but wrong about individual technologies stagnating, because the movement of workers to low-productivity sectors may be dragging down growth. In short, you cannot talk about aggregate productivity growth without talking about both technology and the distribution of workers across sectors. A whole raft of posts and articles (here, here, here, here) has shown up recently regarding “rent-seeking”. This is kind of a catch-all for increased concentration within industries, more lenient anti-trust enforcement, and the increasing share of corporate profits in output. This is then tied to the slowdown in wages over the last few decades, increasing inequality, and even to slower aggregate growth. The arguments made by those doing the concentrating and profit-making is that they are promoting efficiency, productivity, and hence growth. Do we know whether concentration or rent-seeking would be good or bad? Barriers to productivity growth: “The limits to productivity growth are set only by the limits to human inventiveness” says John Kay. This understates the problem. There are other limits. I’d mention two which I think are under-rated. The second is that, as Brynjolfsson and MacAfee say, "significant organizational innovation is required to capture the full benefit of…technologies." For example, Paul David has described (pdf) how the introduction of electricity into American factories did not immediately raise productivity much, simply because it merely replaced steam engines. It was only when bosses realized that electric motors allowed factories to be reorganized – dispensing with the need for machines to be close to a central power source – that productivity soared, as workflow improved and new cheaper buildings could be used. This took many years. However, there are always obstacles to the social and organizational change necessary for technical change to lead to productivity gains. These might be cognitive – such as the Frankenstein syndrome or “not invented here” mentality. Or they can be material. Socio-technical change is a process of creative destruction, the losers from which kick up a stink; think of taxi-drivers protesting against Uber. The big question facing us is, therefore: do we have the right set of institutions to foster the socio-organizational change that beget productivity growth? These require a mix of healthy markets, to maximize ecological diversity; a financial system which backs risky new-comers; property rights which incentivise innovation; and state intervention that facilitates all these whilst not being captured by Luddites. If our politics weren’t so imbecilic, this question would be getting a lot more attention than it is. Related: How concerned should we be about business investment and productivity growth? - Nick Bunker. Inflation and Activity – Two Explorations and their Monetary Policy Implications Olivier Blanchard, Eugenio Cerutti, and Lawrence Summers NBER Working Paper No. 21726 November 2015: Introduction: We explore two empirical issues triggered by the Great Financial Crisis. First, in most advanced countries, output remains far below the pre-recession trend, leading researchers to revisit the issue of hysteresis... Second, while inflation has decreased, it has decreased less than was anticipated (an outcome referred to as the “missing disinflation’’), leading researchers to revisit the relation between inflation and activity. Finally, in the last section, we explore the implications of our findings for monetary policy. The findings of the second section have opposite implications for monetary policy... To the extent that recessions are due to the perception or anticipation of lower underlying growth, this implies that estimates of potential output, based on the assumption of an unchanged underlying trend, may be too optimistic, and lead to too strong a policy response to movements in output. However, to the extent that recessions have hysteresis or super-hysteresis effects, then the cost of allowing downward movements in output in response to shifts in demand increases implies that a stronger response to output gaps is desirable. Rethinking Parameters of the US Welfare State, by Tim Taylor: ...The ... question ... was about whether the welfare state undermines productivity and growth. Garfinkel and Smeeding point out that in the big picture, all the high-income and high-productivity nations of the world have large welfare states; indeed, one can argue that growth rates for many high-income nations were higher in the mid- and late 20th century, when the welfare state was comparatively larger, than back in the 19th century when the welfare state was smaller. Indeed, improved levels of education and health are widely recognized as important components of improved productivity. As they write: "Furthermore, by reducing economic insecurity, social insurance and safety nets make people more willing to take economic risks." Casual workers have little or no effective claim to the rent component of any firm’s value added... If the division of corporate rents has indeed been shifting against labor, an increasingly casual work force will find it very hard to reverse that trend. Of the concrete steps that would help to widen flourishing, a reform of education stands out. The problem here is not a perceived mismatch between skills taught and skills in demand. ... The problem is that young people are not taught to see the economy as a place where participants may imagine new things, where entrepreneurs may want to build them and investors may venture to back some of them. It is essential to educate young people to this image of the economy. I'm skeptical that this is the answer to our inequality/job satisfaction problems. You can just scrape 4% growth if you continue to assume that structural reforms to the U.S. economy can add $3 trillion to potential GDP and that the convergence parameter is ... more than twice as big as any reliable empirical estimate. Or you could ... assume that structural reforms were capable of pushing potential GDP to $26 trillion, a 53% increase over potential GDP today. Both are huge stretches, and almost certainly wrong. Effects of income inequality on economic growth: ... Conclusion Our empirical analysis is motivated by the theoretical work of Galor and Zeira (1993). who examined the relationship between inequality and aggregate output in the presence of credit market imperfections and indivisibilities in human capital investment. Galor and Zeira’s model predicts heterogeneity in the effects of inequality on aggregate output across countries' initial income levels. Taking this prediction seriously, our econometric model included an interaction between measures of income inequality and countries' initial level of GDP per capita. Instrumental variables estimates showed that income inequality has a significant negative effect on aggregate output for the average country in the sample. However, for poor countries income inequality has a significant positive effect. We document that this heterogeneity is also present when considering investment – in particular, investment in human capital – as a channel through which inequality affects aggregate output. Overall, our empirical results provide support for the hypothesis that income inequality is beneficial to economic growth in poor countries, but that it is detrimental to economic growth in advanced economies. Why growth in finance is a drag on the real economy: A booming financial sector means economic growth. Or does it? This column presents new evidence showing that when the financial sector grows more quickly, productivity tends to grow disproportionately slower in industries with either lower asset tangibility or in industries with higher research and development intensity. It turns out that financial booms are not, in general, growth-enhancing. Not sure why "Doesn't Work" was added to the title -- my point is that it does, if only Republicans would support it. Secular Stagnation in the US, by Robert E. Hall: The disappointing post-crisis performance of the US economy and even more disappointing performance of continental Europe and Japan have revived interest in the possibility of secular stagnation. Under stagnation, real incomes fail to grow or even shrink, and the economy’s output falls farther and farther below its earlier upward trend. Rising unemployment may also occur. Summers (2014) ignited interest in the possibility of secular stagnation. Extreme slack persists in continental Europe and Japan, but in the US, several labor-market indicators, such as low short-term unemployment and high levels of unfilled job openings, indicate the end of the period of slack that followed the crisis, while others, such as long-term unemployment and involuntary part-time work, still show slack but are declining and will probably reach normal levels in the coming year.1 Forecasters believe that the Fed will unpin the short-term interest rate in the middle of 2015 or a bit later in the year. Markets for forward rates agree. Despite the resumption of normal conditions in the US labor market and the consensus that slack is gone, the US economy is stagnated in the sense that the standard of living stopped growing around 2000. Family purchasing power today is just the same as in that year. Figure 1 shows that it grew briskly during the 1990s, slowed markedly prior to the crisis, dropped below its 2000 level as a result of the crisis, and grew slowly in recent years. Four factors account for the stagnation of purchasing power in the US economy: 1) declining labor share; 2) depleted capital; 3) reduced productivity growth; and 4) declining labor-force participation. I will discuss indexes that capture each of these factors in turn using indices that all start at unity in 1989. An index of total purchasing power from earnings is the result of multiplying the four indexes together. Labor’s declining share of income. Figure 2 shows an index of labor’s share (including fringe benefits) of total US income. It tends to be level in recessions, fall during the first half of ensuing expansions, then rise back to a high level at the next recession. But superimposed on that pattern is a general decline that cumulates to about 10% over the period. Like the general declining trend in earnings, the decline in the share seems to have started around 2000. Economists have pursued multiple explanations of the decline, but no consensus has formed. Because declining hours account for the biggest part of the stagnation of earnings, I will dig deeper, by breaking them down into three components: Labor-market participants per household; fraction of participants working; and hours per worker. As the chart illustrates, participation rose during the 1990s, especially in the second half of the decade, but has fallen since. The Great Recession depressed participation only slightly and does not appear to have been an important determinant of the overall decline in involvement in the labor market. Of course, the recession was a time when fewer participants were actually working and more were looking for work. Economists have been working hard on trying to understand the surprising decline in participation, which exceeds forecasts that were made in earlier years. Most research agrees that the slack labor market had a relatively small discouraging effect. Another suspect that has been found to have at most a small role is changes in the composition of the working-age population – the negative effect of aging of the population on participation just offsets the positive effect of higher educational attainment. A large increase in the fraction of households subject to taxes imposed on families benefiting from food stamps, disability, and other safety-net programs may be a factor. Capital seems likely to continue to return to its historical growth path, as Figure 4 suggests. For the three other major categories, forecasting is a challenge. There has been no sign of a reversal of the decline in labor’s share of total income and no body of research that supports the idea that it will. Productivity growth is definitely under way, at rates similar to those in the 1970s and 1980s, but well below the rates of the 1950s, 1960s, and 1990s. In particular, there is no sign that a burst of productivity growth will make up for the complete stall in productivity growth around the crisis, as Figure 3 shows. Most importantly, there is no sign suggesting a departure from the decline in labor-force participation shown in Figure 6. Some commentators have declared a turnaround in participation based on recent monthly data, but Figure 9 suggests this is wishful thinking. Participation has declined along a straight line during the period of improving conditions in the labor market, suggesting a complete disconnect between participation and the state of the labor market. Faster productivity growth would be great. I’m just not at all sure we can count on it to lift middle-class incomes: Recently, a number of economists and commentators have suggested that faster productivity growth would be a big way to boost the income of middle-class households. I’m all for faster productivity growth, though I’d argue no one knows how to reliably make it happen. But given the wedge of inequality between productivity and low and middle incomes, wages, and wealth, I’m skeptical that this would work as well as some think. I tried to make a similar point here: Full Employment Alone Won’t Solve Problem of Stagnating Wages. Secular Stagnation: The Long View, by Matt Nesvisky: Growth economists are divided on whether the U.S. is facing a period of "secular stagnation" - an extended period of slow economic growth in the coming decades. In "Secular Stagnation: The Long View" (NBER Working Paper No. 20836), Barry Eichengreen considers four factors that could contribute to a persistent period of below-potential output and slow growth: a rise in saving due to the global integration of emerging markets, a decline in the rate of population growth, an absence of attractive investment opportunities, and a drop in the relative price of investment goods. 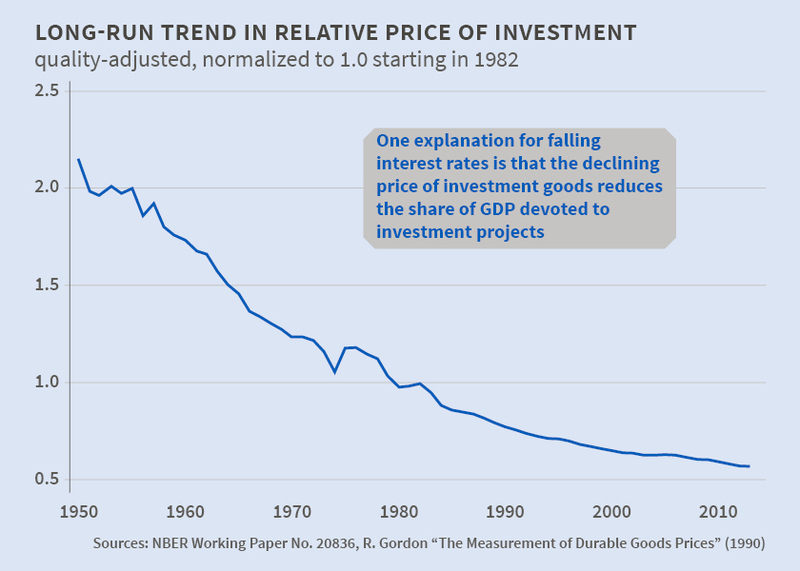 He concludes that a decline in the relative price of investment goods is the most likely contributor to an excess of saving over investment. With regard to long-term future growth rates, a key point of debate is how to interpret, and project forward, the "Third Industrial Revolution": the computer age and the new economy it has created. 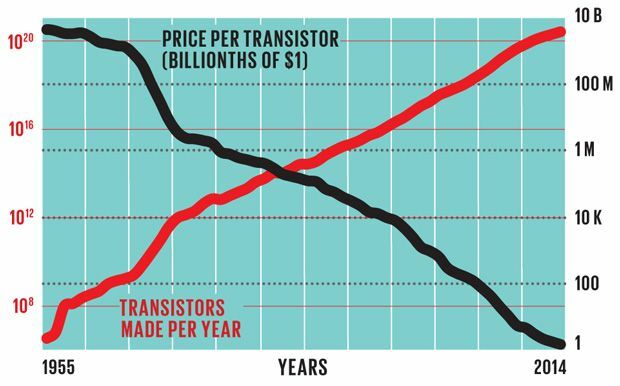 Some argue that the economic impact of digital technology has largely run its course, while others maintain that we have yet to experience the full effect of computerization. In this context, Eichengreen looks at the economic consequences of the age of steam and of the age of electrification. His analysis identifies two dimensions of the economic impact: "range of applicability" and "range of adaptation." Range of applicability refers to the number of sectors or activities to which the key innovations can be applied. Use of the steam engine of the first industrial revolution for many years was limited to the textile industry and railways, which accounted for only a relatively small fraction of economic activity. Electrification in the second industrial revolution, says Eichengreen, had a larger impact on output and productivity growth because it affected a host of manufacturing industries, many individual households, and a wide range of activities within decades of its development. The "computer revolution" of the second half of the 20th century had a relatively limited impact on overall economic growth, Eichengreen writes, because computerization had deeply transformative effects on only a limited set of industries, including finance, wholesale and retail trade, and the production of computers themselves. This perspective suggests that the implications for output and productivity of the next wave of innovations will depend greatly on their range of applicability. Innovations such as new tools (quantum computers), materials (graphene), processes (genetic modification), robotics, and enhanced interactivity of digital devices all promise a broad range of applications. Range of adaptation refers to how comprehensively economic activity must be reorganized before positive impacts on output and productivity occur. Eichengreen reasons that the greater the required range of adaptation, the higher the likelihood that growth may slow in the short run, as costly investments in adaptation must be made and existing technology must be disrupted. Yet the slow productivity growth in the United States in recent years may have positive implications for the future, he writes. Many connected activities and sectors - health care, education, industrial research, and finance - are being disrupted by the latest technologies. But once a broad range of adaptations is complete, productivity growth should accelerate, he reasons. "This is not a prediction," Eichengreen concludes, "but a suggestion to look to the range of adaptation required in response to the current wave of innovations when seeking to interpret our slow rate of productivity growth and when pondering our future." Is Measurement Error a Likely Explanation for the Lack of Productivity Growth in 2014? : Over the past three years nonfarm business sector labor productivity growth has averaged only around 0.75 percent—well below historical norms. In 2014 it was negative, as can be seen in chart 1. The previous macroblog post by Atlanta Fed economist John Robertson looked at possible economic explanations for why the labor productivity data, taken at face value, have been relatively weak in recent years. In this post I look at the extent to which “measurement error” can account for the weakness we have seen in the data. By measurement error, I mean incomplete data and/or sampling errors that are reduced when more comprehensive data are available several years later. I do not mean the inherent difficulties in measuring productivity in sectors such as health care or information technology. As seen in chart 1, negative four-quarter productivity growth rates have been quite infrequent in nonrecessionary periods since 1948. In S. Borağan Aruoba's 2008 Journal of Money, Credit and Banking article “Data Revisions Are Not Well Behaved,” he found that initial estimates of annual productivity growth are negatively correlated with subsequent revisions. That is, low productivity growth rates tend to be revised up while high rates tend to be revised down. This is illustrated in chart 2. In each of the panels, points in the scatterplot represent an initial estimate of fourth-quarter over fourth-quarter productivity growth together with a revised estimate published either one or three years later. For example, the green points in each plot show estimates of productivity growth over the four quarters ending in the fourth quarter of 2011. In each plot, the x-coordinate shows the March 7, 2012, estimate of this growth rate (0.3 percent). The y-coordinate of the green dot in chart 2a shows the March 7, 2013, estimate of fourth-quarter 2011/fourth-quarter 2010 productivity growth (0.4 percent) while the y-coordinate of the green dot in chart 2b shows the March 5, 2015, estimate (0.0 percent). In each chart, the red dashed line shows the predicted revised value of productivity growth as a function of the early estimate (using a simple linear regression). Chart 2a shows that, on average, we would expect almost no revision to the most recent estimate of four-quarter productivity growth one year later. Chart 2b, however, shows that low initial estimates of productivity growth tend to be revised up three years later while high estimates tend to be revised down. Based on this regression line, the current estimate of -0.1 percent fourth-quarter 2014/fourth-quarter 2013 productivity growth is expected to be revised up to 0.3 percent by April 2018. The intuition for this is fairly straightforward. Low productivity growth could come about from either underestimating output growth, overestimating growth in hours worked, or a combination of the two. Which of these is most likely to occur, according to historical revisions? This is shown in chart 3, which plots the predicted revisions to four-quarter nonfarm employment growth and four-quarter nominal gross domestic product (GDP) growth conditional on two assumed values for the initial estimate of four-quarter productivity growth: 0 percent (low) and 4 percent (high). Nominal GDP is used instead of real GDP as methodological changes to the latter (e.g., the introduction of chain-weighting starting in 1996) make an apples-to-apples comparison of pre- and post-revised values difficult. Using fourth-quarter over fourth-quarter growth rates since 1981, the diamonds on the solid lines in chart 3 show that an initial estimate of 0 percent productivity growth would, on average, be associated with a three-year upward revision of 0.39 percentage point to four-quarter nominal GDP growth and a three-year downward revision of 0.10 percentage point to four-quarter nonfarm payroll employment. With 4 percent productivity growth, the diamonds on the dashed lines show predicted three-year revisions to nominal GDP growth and employment growth of -0.40 percentage point and 0.14 percentage point, respectively. As the chart shows, these estimates are sensitive to the sample period used to predict the revisions. Using only data since 1989 (not shown), the regression would not predict a downward revision to employment growth conditional on an initial estimate of 0 percent productivity growth. Overall, however, the plot suggests that revisions to output growth are more sensitive to initial estimates of productivity growth than revisions to payroll employment growth are. This is consistent with the sentiments expressed by Federal Reserve Vice Chairman Stanley Fischer and Atlanta Fed President Dennis Lockhart at the March 30–April 1 Financial Markets Conference that employment or unemployment data may be more reliably measured than GDP. Nevertheless, according to charts 2 and 3, the importance of measurement error in productivity growth is fairly modest. Ex-ante, we should not expect last year's puzzlingly low productivity growth simply to be revised away. What Seems to Be Holding Back Labor Productivity Growth, and Why It Matters: The Atlanta Fed recently released its online Annual Report. In his video introduction to the report, President Dennis Lockhart explained that the economic growth we have experienced in recent years has been driven much more by growth in hours worked (primarily due to employment growth) than by growth in the output produced per hour worked (so-called average labor productivity). For example, over the past three years, business sector output growth averaged close to 3 percent a year. Labor productivity growth accounted for only about 0.75 percentage point of these output gains. The rest was due primarily to growth in employment. 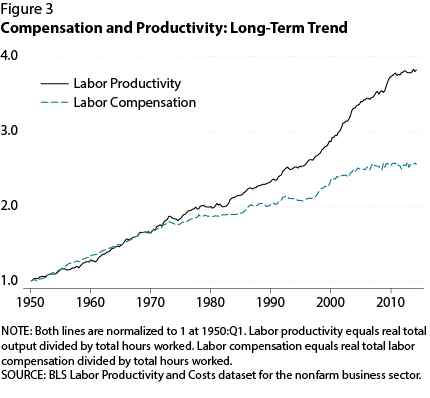 The recent performance of labor productivity stands in stark contrast to historical experience. Business sector labor productivity growth averaged 1.4 percent over the past 10 years. This is well below the labor productivity gains of 3 percent a year experienced during the information technology productivity boom from the mid-1990s through the mid-2000s. Everything else—all the drivers of labor productivity growth that are not embodied in the other factors. This component is often called total factor productivity. The chart below displays the decomposition of labor productivity for various time periods. The bar at the far right is for the last three years (the next bar is for the past 10 years). The colored segments in each bar sum to average annual labor productivity growth for each time period. Taken at face value, the chart suggests that a primary reason for the sluggish average labor productivity growth we have seen over the past three years is that capital spending growth has not kept up with growth in hours worked—a reduction in capital deepening. Declining capital deepening is highly unusual. Do we think this sluggishness will persist? No. In our medium-term outlook, we at the Atlanta Fed expect that factors that have held down labor productivity growth (particularly relatively weak capital spending) will dissipate as confidence in the economy improves further and firms increase the pace of investment spending, including on various types of equipment and intellectual capital. We currently anticipate that the trend in business sector labor productivity growth will improve to a level of about 2 percent a year, midway between the current pace and the pace experienced during the 1995–2004 period of strong productivity gains. That is, we are not productivity pessimists. Time will tell, of course. Clearly, this optimistic labor productivity outlook is not without risk. For one thing, we have been somewhat surprised that labor productivity has remained so low for so long during the economic recovery. Moreover, the first quarter data don't suggest that a turning point has occurred. Gross domestic product (GDP) in the first quarter is likely to come in on the weak side (the latest GDPNow tracking estimate here is currently signaling essentially no GDP growth in the first quarter), whereas employment growth is likely to be quite robust (for example, the ADP employment report suggested solid employment gains). As a result, we anticipate another weak reading for labor productivity in the first quarter. We are not taking this as refutation of our medium-term outlook. The 1975–84 period experienced high unit labor costs because labor productivity growth didn't keep up with wage growth. In contrast, the relatively low and stable average unit labor cost growth we have experienced since the 1980s has been due to wage growth largely offset by gains in labor productivity. Our forecast of stronger labor productivity growth implies faster wage growth as well. That said, a rise in wage growth absent a pickup in labor productivity growth poses an upside risk to our inflation outlook. Of course, the data on productivity and its components are estimates. It is possible that the data are not accurately reflecting reality in real time. For example, colleagues at the Board of Governors suggest that measurement issues associated with the price of high-tech equipment may be causing business investment to be somewhat understated. That is, capital deepening may not be as weak as the current data indicate. In a follow-up blog to this one, my Atlanta Fed colleague Patrick Higgins will explore the possibility that the weak labor productivity we have recently experienced is likely to be revised away with subsequent revisions to GDP and hours data. Second, I think that the most important macroeconomic research question of our age is the extent to which these fluctuations in the projected growth path arise because of signal-processing considerations in an environment in which the growth rate is subject to both transitory and permanent shocks, rather than to short-run shocks casting very long-run shadows. To the extent that it is the second–and the older I get the more it looks to me as though it might well be–the more it becomes the case that successful management of aggregate demand and the business cycle is the ball game, rather than just being an amuse bouche that it is nice to have. US economy: The productivity puzzle, by Robin Harding: To glimpse the miracle of productivity growth there is nowhere better to look than the ... US Corn Belt. A hundred years ago, an army of farmers toiled to produce 30 bushels an acre; now only a few hands are needed to produce 160 bushels from the same land. The rise of modern civilisation rested on this trend: for each person to produce ever more. For the past 120 years, as if bound by some inexorable law, output per head of population increased by about 2 per cent a year. That is, until now. Yet there are also techno-optimists, such as Erik Brynjolfsson and Andrew McAfee..., whose faith in new discoveries is such that they expect growth to accelerate, not decline. Then there are more phlegmatic economists, whose answers are less exciting but also less speculative – and come in a bit below 2 per cent for growth in output per head. Pricing Power and Lower Potential GDP: One of the results of the Great Recession has been a severe downward revision in potential GDP across many countries. Laurence Ball just had a Vox post on this..., finding that potential GDP is lower by 8.4% on average across the OECD, and up to 30% lower in places like Greece. This is similar to Fernald’s recent finding that potential GDP is lower in the U.S., the only difference being that Fernald finds the slowdown in potential GDP started before 2007. Potential GDP is growing more slowly than previously because of slower capital accumulation, slowing (or falling) labor force participation, and/or lower growth in total factor productivity (TFP). One interpretation of slowing TFP growth is that we are actively getting worse at innovating and/or bringing innovations to market. For Fernald, the burst of innovations coming from the IT revolution are running out. 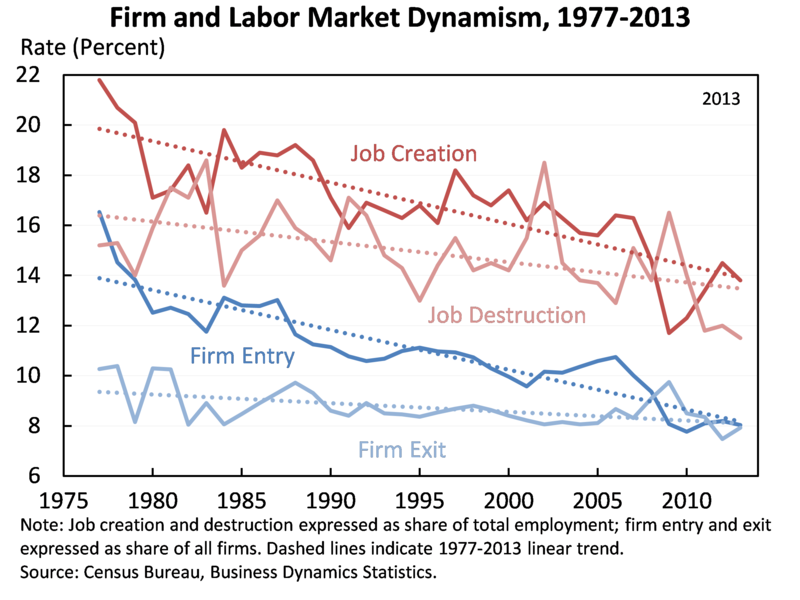 In a recent Brookings report, new firms are not starting up as quickly, possibly reducing the rate at which new innovations are brought on board. Ball doesn’t really take a stand on what is happening, but the implication is that the Great Recession did something that is pulling down productivity levels. Is Monetary policy Keeping Real Wages and Productivity Low? ...suppose that at the moment real wages or inflation begin to rise, the central bank tightens monetary policy. This would raise the cost of capital, and could be interpreted as an attempt to prevent real wages rising. ... Monetary policy, which in theory is just keeping inflation under control, is in fact keeping real wages and productivity low.